In this tutorial , we are going to see Android SeekBar example. SeekBar is extension of ProgressBar. You can drag cursor left or right to select correct value. It is generally used in setting brightness or music progress or setting sound. It is very easy to create SeekBar in Android. Just follow below steps to create SeekBar. 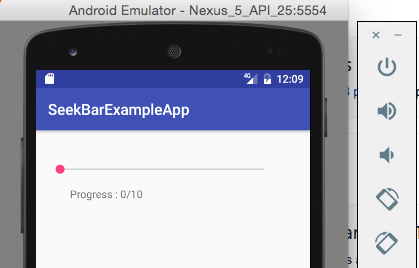 Create an android application project named “SeekBarExampleApp”. We are getting widget reference from layout file and then using SeekBar’s setOnSeekBarChangeListener method to set listener for our seekbar. Drag ping circle and use it to set the value for SeekBar. 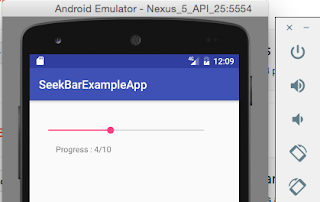 We are done with Android SeekBar example.